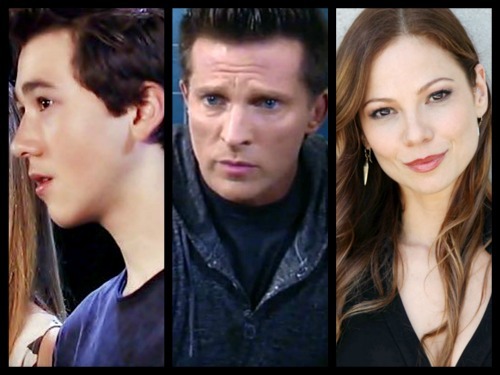 General Hospital (GH) spoilers tease that it’s official! Tamara Braun (ex-Carly) is headed back to the ABC soap. Entertainment Weekly confirmed the news, so now we can focus on who Braun’s playing and why she’ll be showing up in Port Charles. There are already a few clues about Braun’s potential character, so let’s examine some of those. It seems Braun’s going to be tied to Steve Burton’s (ex-Jason, Patient Six) storyline. We also know that Oscar (Garren Stitt) will have a connection to Burton’s character. Plus, the teen still needs a mom! When you put all that together, it makes sense that Braun will probably play Dr. Kim Nero. Since Patient Six could be the person who ties Kim and Oscar together, it sounds like he could be Oscar’s father. That lines up with what Kim has told her son. Oscar claims his mom doesn’t like to talk about his dad. She doesn’t think he’s a good guy and has hinted that he might be dangerous. Patient Six is most likely the real Jason Morgan, so it’s understandable that Kim wanted to keep her distance from risky “Stone Cold.” It’s possible Kim never even told Oscar’s father that she was pregnant. She might’ve thought it’d be safer to keep Daddy in the dark and raise Oscar on her own. Whatever the case, Oscar will find out who his father is sooner or later. General Hospital spoilers say Josslyn (Eden McCoy) could be instrumental in uncovering the truth. It’s clear that she has no intention of letting this go. Oscar acts like he’s OK with the mystery, but Josslyn can tell that he wants answers deep down. He’ll get those answers sooner or later, but Kim isn’t going to be happy! That should put an angry Kim in Sonny (Maurice Benard) and Carly’s (Laura Wright) orbit. Carly is already quite anxious to meet Oscar’s mom, but their first interaction may not be as pleasant as she hopes. If Braun is indeed Dr. Kim Nero, it should be fun to see the old Carly face off with the new Carly. However, that may not be the only story Kim’s involved in. Many GH fans can’t ignore the resemblance between Chloe Lanier (Nelle) and Braun. Perhaps the show won’t ignore it either! Lanier looks like she could be Braun’s daughter, so why not make that happen on General Hospital? Nelle’s mother could be alive after all! Kim might’ve secretly abandoned Nelle before building a new life for herself. This could create even more issues for Nelle, but they could work things out eventually. Nelle would finally have a family through her mother and half-sibling, but she’d also give Carly another reason to fume. Kim’s ties to classic Jason and Oscar could keep Nelle in Carly’s circle indefinitely. General Hospital spoilers say Braun will debut in her new role on November 22, so stay tuned! We’ll give you updates as other GH details emerge. Stick with the ABC soap and don’t forget to check CDL often for the latest General Hospital spoilers, updates and news.